You will earn 11,702 Reward Points. Earn 1 reward point for every 1 dollar spent. For large parties and other events, it's crucial to have the Geneva 76710 Bristol Portable Bar. This bar is 47.50 inches tall and 60 inches wide. Instantly add the “WOW” factor to any setting with Geneva’s Bristol Collection. This unique collection delivers an artisan-designed, upscale vibe highlighted by fine woodcraft, panelized front and stainless steel inlay accents. Recessed casters give this attractive piece a “built-in” look. Our models are handcrafted in the USA. Geneva’s portable bars offer design flexibility; you can add options for the interior and exterior to tailor your establishment. We offer excellent lead times. We are the only ones that offer the option that converts the bar to furniture with a convertible speed rail. STAINLESS STEEL WORKSTATION: Work surface shall be constructed of 16- gauge stainless steel. The backsplash shall be constructed of 20-gauge stainless steel. ICE BIN WITH DRAIN: Ice bin shall have enclosed foam insulation with drain. Ice bin shall have a 50 lb. ice capacity. *6 circuit sealed-in cold plate shall be compatible for use with Pre-Mix and Post-Mix systems. CONVERTIBLE SPEED RAIL OPTION: This option converts your bar from functional beverage service to spacesaving furniture in seconds. Stainless steel inserts to make It easy to remove beverages after the event is complete. EXTERIOR: Available in Antique Cherry, Golden Pecan, Puritan Pine, and Red Mahogany. Carts are constructed with the finest hardwood lumber solids and veneers using the latest in joinery techniques, including time tested mortise and tenon joints. Basic Frame and Panel construction is used where applicable, as well as applied moldings to create the rich quality look and feel of fine furniture. These units are sprayed with pigmented stains and hand wiped to achieve the desired color tones. They are then coated with a hybrid post catalyzed acrylic , KCMA certified, for a beautiful, protective high luster finish, that will last even in the most difficult environments. TOP: There are many surfaces available. Wood- material options are Golden Pecan, Puritan Pine, Antique Cherry, and Red Mahogany. 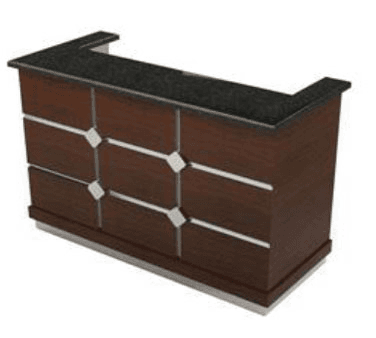 Solid surface material options are Bone, Rocky Road Granite, Lave Granite, and Ebony Granite. Granite material options are Luna Pearl, and Uba Tuba, also stainless steel. Additional solid surface options available.